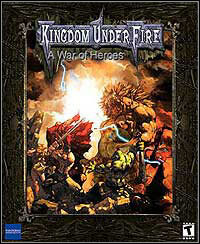 Kingdom Under Fire is an interesting combination of typical RTS and cRPG games. The forces of good and evil meet again, it is up to you to decide which side you want to take. Each of the parties to the conflict received its own, long for 30 missions campaigns. The single-player campaign mode contains an intricate story that reveals itself as the player progresses from mission to mission. As each mission unfolds, the truth behind the war is revealed little by little, as are relations between heroes. With the support of Phantagram's servers at www.wargame.net, up to eight players will be able to play simultaneously in Ladder- and League-mode multi-player games. Game score 7.64 / 10 calculated out of 326 players' votes.